Do You Have The Letter V On Your Palm? Everyone has lines on their palms. Each line means something, according to palmistry, and we can guarantee you will be shocked to learn what the lines on your palms mean! Some tell what you are like as a person while others can show how successful you will be. There is a lot to be revealed when it comes to your palms! In this article, we will be taking a look at what the letter “V” means if you have it in your palm. It is a significant line that is found on the heart line. Read on for more! Your heart line is part of four significant lines that tell a lot about a person. 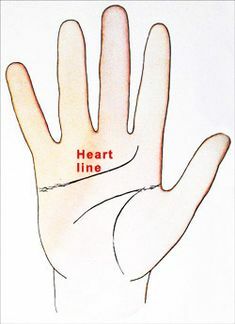 In palmistry, the heart line is the one that predicts both your emotions and your relationships. You can find out a ton about a person without even knowing them! Some people don’t have the heart line on their palm. Those people can be quite heartless throughout their lives. They often show little love, appreciation and regret towards anyone or anything, unless it is towards themselves. But your heart line doesn’t just predict the present or future, it can say a lot concerning any past relationships you have had, as well. Do You Have A “V” On Your Heart Line? If you have the letter “V” on your heart line, you will want to know the following important information about the qualities you have. Having the letter “V” could indicate that you have unfinished business you need to attend to. It can also point towards personal development. Men and women with a “V” are thought to be very lucky in life. They are generally successful and wealthy. Those who have this special letter on their palms are believed to be very blessed individuals who are great friends. They either are or will be blessed with a large fortune. They easily make friends with other trustworthy people who are there to support them through the trials and tribulations of life. You aren’t just blessed in life when you have the letter “V” on your palm. You enjoy a lot of luck throughout your life and you will make a name for yourself in the world! But don’t worry if it hasn’t happened yet. Many times, it takes until you turn 35 years old to have your luck change for the better. When it does, look out world!